Cronkhite heavy duty deck-over construction trailers are built to handle the heaviest loads and withstand the toughest construction environment. Available in axle capacities ranging from 14,000 Lb to 40,000 Lb. These trailers are designed for hauling larger equipment like tractors, backhoes, bulldozers, pavers, excavators, and crawlers. They feature wider deck widths up to 102” and additional deck lengths. The loading ramps are ladder style, spring assist, 5’x18”, and are adjustable “side to side”. The ramps fold and lay flat on the deck. The deck floor is very durable with 2” Solid Oak hardwood. The frame of the trailer is crafted out of 10” or 12” Wide Flange I-Beam construction. 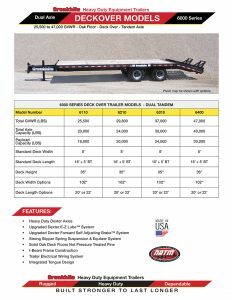 In addition each trailer has a minimum of 10 tie downs, 10,000 Lb semi-style drop leg jack, and an electrical wiring system encased in steel conduit. 7’ double break beavertail available as an option.